ASPA SmartBrief’s November 21 posting blazed the sensational headline; “Connecticut Governor will face potential $2B (budget) deficit.” Budgets are simply fiscal projections of anticipated revenues and expenditures over a selected period of time. Deficits occur when these two elements do not align. Clearly, the newly elected Governor was positioning his initial agenda to finally manage the state’s finances that had plagued and perplexed previous administrations. To those of us that have wrestled deficit budgets back to solvency, the announcement was a welcome approach by an elected official in his determination to honestly face fiscal problems. Governor-elect, Ned Lamont’s forthright approach prompted a clarion call to public administration. To launch his initiative he stated he was “looking for new blood, where it’s necessary, and different backgrounds to help lead the state.” To assemble the administrative team, two experienced headhunters were selected to find people “that are willing to challenge me every day, challenge the old way of doing business… that’s what I want for the next four years around here.” The message was sustained by the Lt. Governor-elect, Susan Bysiewicz; “We want to be choosing the top people for the top roles that will be critical partners for Ned and I as we lead our state.” They have already received hundreds of resumes. Clearly, their intended approach has already generated excited interest months before their assumption of office on January 9. The Governor-elect announced several initiatives designed to increase revenues in the same article posted by ASPA by stating that he would consider a toll on large trucks that could generate an estimated $250 million per year. During the campaign leading to his election, he had also suggested using the annual proceeds from the Connecticut Lottery-about $350 million- to the state’s starved pension fund for municipal teachers. But those funds are currently used in the State’s General Fund according to an October 23 posting on CTMirror.org. Finally, according to theday.com published on June 3, Lamont responded with a “yes” to a question concerning possible tax increases but provided no details. He also claimed that new revenues could be obtained by collecting sales taxes from online purchases even though this has already been done by the previous Governor. Balancing the budget with revenue enhancements presents a daunting task for the Governor-elect. According to an article posted in The Atlantic Monthly on July 2, 2017, “the typical resident pays both hefty state income taxes (among the ten highest in the country).” Tax increases that were implemented in 2011 and 2015 “went entirely toward pension costs.” But according to a yankeeinstitute.com posting, they have not plugged the gap created by rising, unfunded pension obligations. The same article indicated that local property taxes are “the third highest” in the nation. Combined with state sales tax rate that was raised in 2011 to 6.35 percent, the overall tax burden paid by the residents of Connecticut is already substantial. The article in the Atlantic Monthly concluded that it is one of the reasons that people and businesses are leaving the state. On the expenditure side, The Governor-elect’s plans for a balanced budget are constrained by decisions of the past. Since Connecticut is one of only two states without functioning county governments, all of its services are provided by state employees who are represented by strong unions. “Labor costs represent the biggest expense in Connecticut’s budget. According to the Office of Fiscal Analysis, employee payroll accounts for $6.2 billion per year, nearly 30 percent of the budget, including $3 billion in fringe benefit costs. Connecticut’s fringe benefit rates are rising dramatically as the state’s unfunded pension liabilities drive up labor costs.” as stated by yankeeinstitute.com in a posting on August 15. 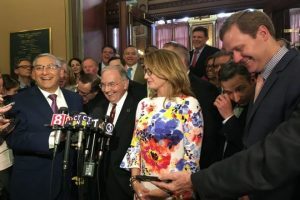 The article also described how the previous Governor, to negotiate concessions with the unions, committed to “a one-time $2,000 bonus in 2018, followed by two consecutive wage increases of 3.5 percent” that have locked-in payroll cost increases for future budgets. Part of the deal also involved locking-in benefits to 2017 and layoff protection until 2022. The state budget also provides $2 billion annually for public education to its cities and towns. Although a recent study has recommended increasing this contribution, Lamont has indicated that this cannot be an option while he faces such a huge deficit. However, during the election campaign, he stated that he “would keep the overall grant the same”, while being open to considering a new cost-sharing formula that might redistribute added funding to the poorest places, as he stated to ctmirror.com. Regardless of whom the recruiters bring to the Governor-elect’s yet-to-be appointed administrative team, closing the $2 billion gap in Connecticut’s budget presents a formidable task. In May, additional road blocks were created by political promises and determined denial, gleefully announced by the legislature and previous governor. Their budget “restored aid for towns and reversed health care cuts” while projecting multi-billion dollar deficits…tied in part to legacy debt costs amassed over eight decades” as reported in ctmirror.org on May 9. But the Governor-elect has added his own fiscal fantasies by preemptively placing political safeguards around existing payroll, pensions or education funding that represent nearly 40% of the budget. To paraphrase Einstein, the problems Connecticut faces cannot be solved with the same level of thinking that created them.